About a month ago now – after our camping trip in Girraween National Park – we spent a few nights in a wooden cabin in Stanthorpe. Autumn had just started and the leaves were turning all shades of copper and gold, perfect for catching the morning sun. The cabin had a wood heater and a deck hidden amongst the trees. There was no internet connection and no phone reception; we watched movies, ate chocolate in bed, and marveled as W took her first proper walk across the room. It was a most lovely way to spend a few days. We also ate copious amounts of apple pie, went apple picking, and drank the best apple cider EVER. A big old tin shed filled with mismatched wooden tables and chairs, Sutton’s serves sweet and savoury pies and a selection of apple-themed takeaway goods – everything from apple juice to apple cider vinegar. 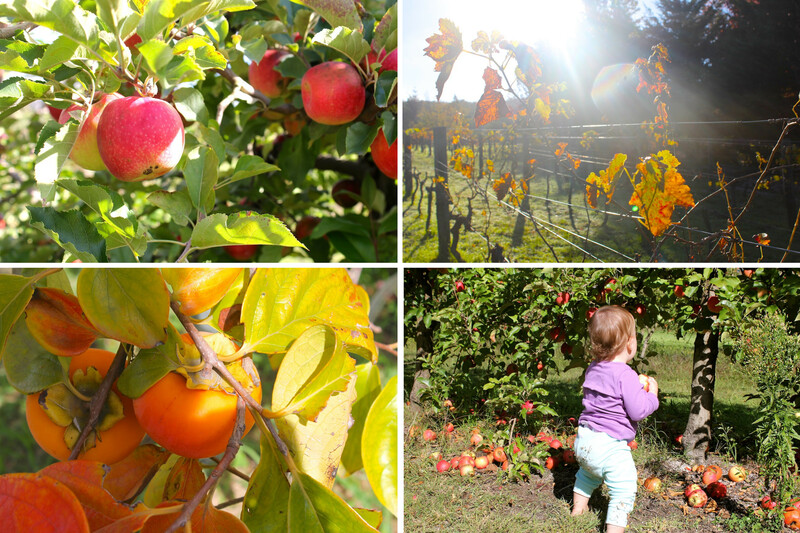 The three of us strolled through their orchards, leisurely tasting apples right off the tree, slowly filling up a bag to take home with us. W definitely loved it – gorging on apples and falling over in the soft grass. The real reason most people stop at Sutton’s, though, is their apple pie. It is straight-up apple pie – no fancy flavourings or twists, just shortcrust pastry and loads-of-apples. The pie comes served in a generous slab, accompanied by fresh cream and a scoop of their homemade apple cider ice cream. The secret to their pie, I’ve been told, is that they chop up some of the apples into tiny pieces and some into large chunks. In the oven, the tiny pieces of apple melt, forming a delicious apple-y sauce around the large chunks. The first day we shared a slice. The next day we went back and got a slice each! So when we got back to Brisbane with a big bag full of freshly picked apples, I knew I was going to be baking something. I thought about pie, but I wanted something autumn-y, something to enjoy with a cuppa in the afternoon sunshine. 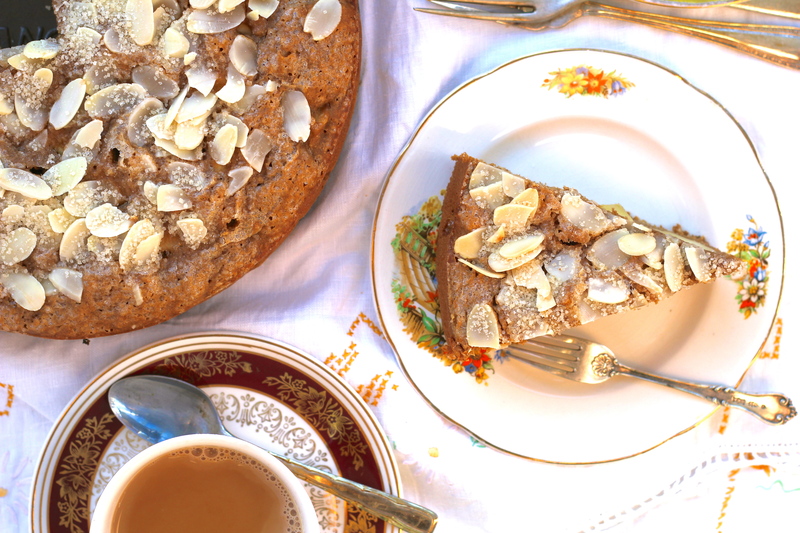 And this Chai Spice Apple Cake is all that and more. 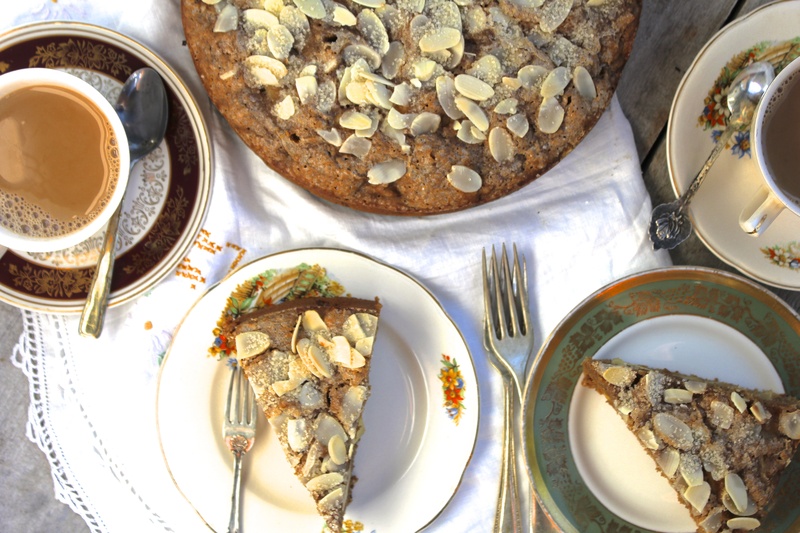 It has a dense moist crumb, and the tea and spices give the cake a wonderful rich flavour. Serve it with a dollop of whipped cream for dessert, with a cup of tea and your feet up for morning tea, or standing up at the kitchen bench with a slice in hand. However you eat it, you’ll love it. Preheat oven to 180°c/350°f. Grease a 20cm spring-form baking tin, and set aside. Pour the milk into a small saucepan and add the black tea. Simmer gently for approx. five – seven minutes, until the milk becomes tea-infused and aromatic. Strain, and set aside to cool. Once strained, the milk should fill half a cup (if you have less make it up with plain milk and if you have more discard anything over half a cup). In a medium-sized bowl, sift together both types of flour, baking powder, and all of the spices. Peel and core the apples and chop into large-ish chunks. Set aside. In a large bowl cream together the brown sugar and coconut oil (if your coconut oil is firm, melt it in a small pot over the stove first). Add the eggs one by one, beating until nice and fluffy. Add the vanilla essence, yoghurt, and milky-tea, and stir thoroughly through. Add the dry ingredients to the wet and combine, taking care not to over-mix. Add the apple chunks and mix through. Scoop the whole lot into your pre-greased baking tin, smoothing the top down with your spoon, and sprinkle over the flaked almonds and raw sugar. Bake for 50 minutes, or until a skewer inserted comes out clean. Leave to cool in the tin for 15 minutes, turn out, and enjoy! 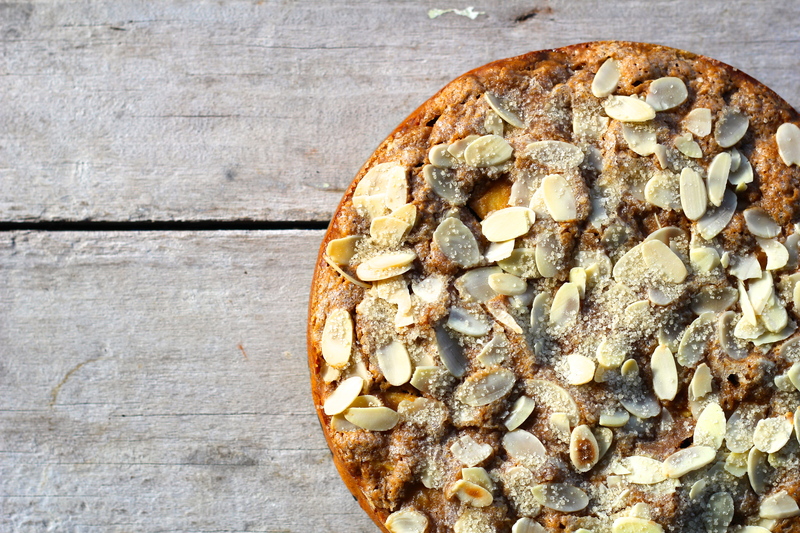 Notes: this cake will keep for three – four days in a sealed container (in fact, I enjoy it more on the second day). I baked it with Pink Lady apples as that it was I had on hand, but I’ve also baked it with Granny Smith apples and it was equally delicious, so feel free to use whatever apples you have laying around. I also suspect this could be made vegan by replacing the regular eggs with flax eggs, but I haven’t yet tried. It will still be delicious in springtime! i’m makin’ it for this fri nite! yum!! 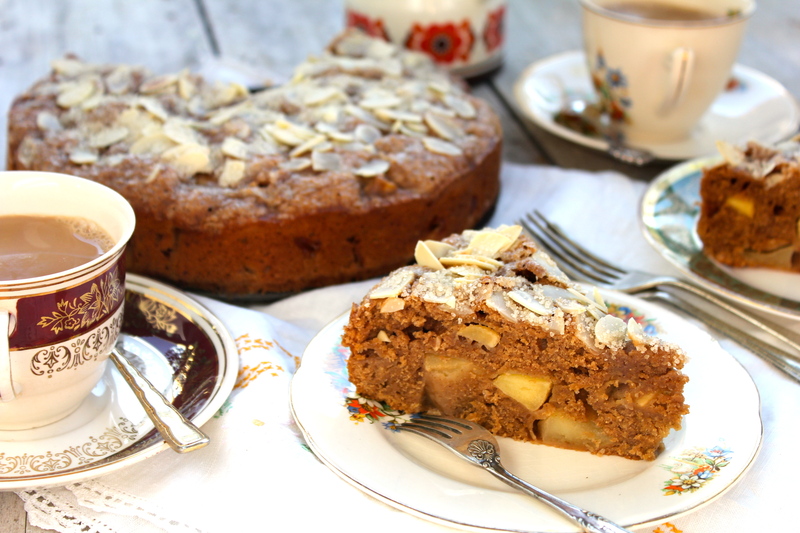 Oh my goodness, I love the chai spices and the apple chunks in this cake. It looks absolutely scrumptious! Thanks Katie! 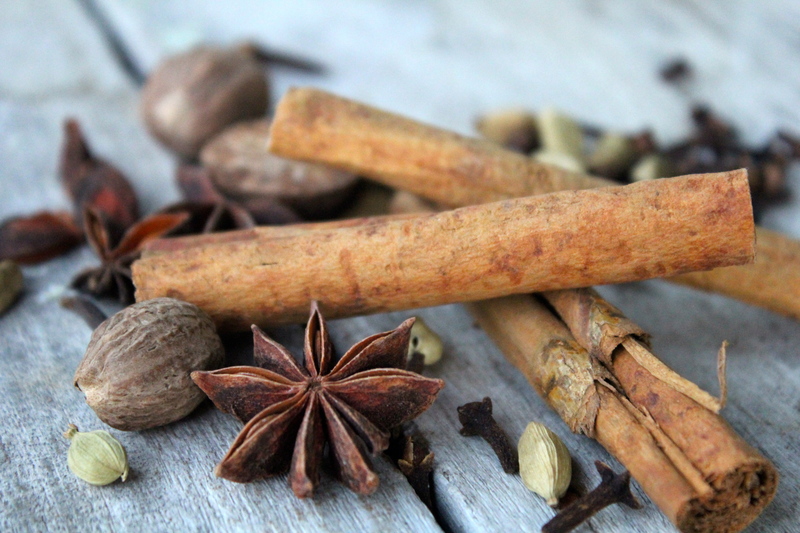 The chai spices really amp the flavour – it’s definitely a new favourite. Very successful, for dessert, last Friday nite. Thumbs up! You definitely should! It’s my new favourite cake.